Send this Scrumptious Chocolate Sensation to your beloved one as a gift and show your affection. 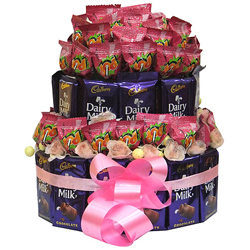 This Chocolate Combo is adorned with 30Pcs Lollipops and 32Pcs Cadbury Dairy Milk Chocolates (13gm) wrapped with a Ribbon. Note: Same Day Delivery at Ahmadabad, Bangalore, Chennai, Coimbatore, Delhi, Ghaziabad, Gurgaon, Howrah, Hyderabad, Jaipur, Kolkata, Mumbai, Nagpur, Navi Mumbai, Noida, Pune, Thane, Trivandrum.